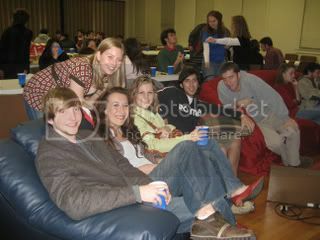 Over 40 students attended a Chanukah party at the University of Alabama Hillel. The students, along with the Alabama administration, have been working to increase Jewish enrollment at the university. The weekend of Jan. 19, Hillel will join with Zeta Beta Tau fraternity and Sigma Delta Tau sorority to offer "26 Hours of the Crimson Tradition" to all interested 11th and 12th grade Jewish high school students. The event begins Jan. 19 with a campus tour at 3:30 pm. The day continues with a "Meet and Greet" over Shabbat dinner at the Hillel followed by a party at the ZBT House. On Jan. 20, the day begins with a bagel brunch at Hillel, followed by the Alabama vs. Georgia basketball game. After the game, a farewell party will be held at the Hillel House. Hillel President Yoni Kutler recently stated "these last 3 years at Alabama have been the most fun years of my life, and everybody should come see it for themselves." Invitations have been sent to students in Alabama and Georgia, and high school students are encouraged to attend as many of the events as they would like. Housing will be arranged for them, and parents of prospective students are invited for the tour and Shabbat dinner at the home of Star and Stan Bloom.